With over 9500 acres to manage of diverse plant communities, species, and water resources, natural resource management plays a significant role in meeting OSBS’s missions. The Station’s conservation program uses adaptive management practices to help direct work flows. 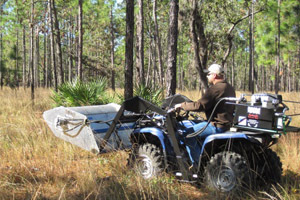 Tools such as prescribed fire for pyrogenic habitats, mechanical/chemical treatments for controlling exotic/invasive species, and silvicultural practices along with groundcover harvesting for restore disturbed habitats are all used in stewardship of this unique facility. As in many of Florida's pyrogenic communities, prescribed fire is our primary conservation tool used to maintain the natural fire regimes. 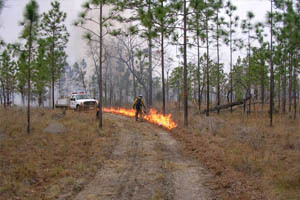 Prescribed fire, also known as controlled burning, is the skillful application of fire to wildland fuels in either their natural or modified state, under specified environmental conditions which allow the fire to be confined to a predetermined area and at the same time to produce the intensity of heat and rate of spread required to attain planned resource management objectives. 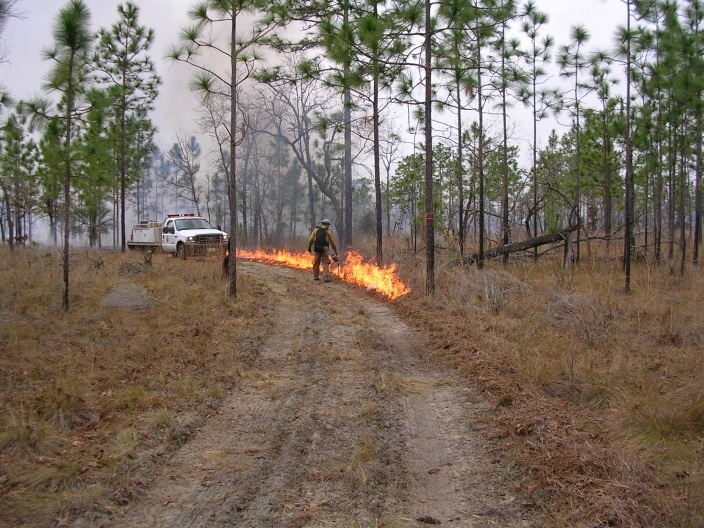 A combination of dormant and growing season prescribed burns as well as lightening ignited fires are utilized to maintain the longleaf pine-wiregrass community on the Station. 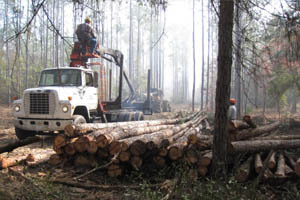 The Fire Management Program at OSBS integrates habitat management with research/education/training as often as possible. An example of this is the annually mentoring opportunity for students to participate on prescribed fires with wildland fire professionals from the National Interagency Prescribed Fire Training Center at Ordway-Swisher in the winter and spring months. Due to the long history of the Station’s lands being under few owners as well as good resource management practices, exotic plant species have not been a major problem. As in most conservation lands, efforts to scout, map, and control unwanted species are ongoing. Most occurrences happening along boundaries with neighbors and roadways as well as new property acquired that may have had a different land use. There are some exotic species such as bahaigrass for example that occurs in old fields and along some roads that we have chosen to live with. Restoration of native groundcover is imperative in restoring native plant communities and systems processes such as fire. 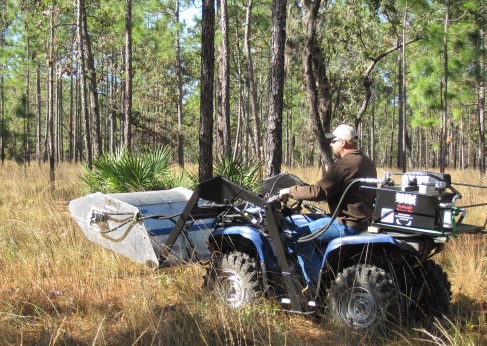 OSBS has established a cooperative agreement with the St. Johns River Water Management District (SJRWMD) involving the harvesting of sandhill groundcover seeds. 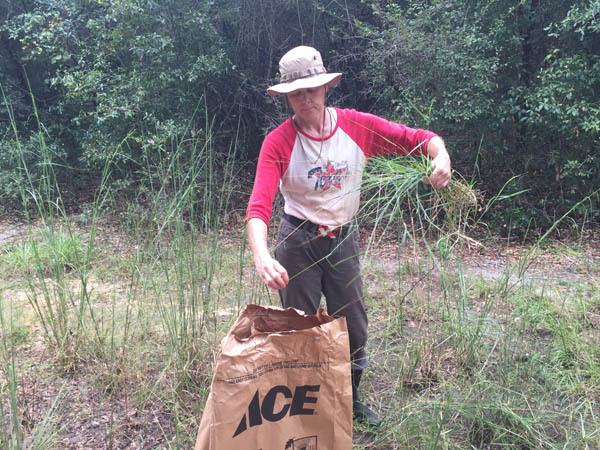 The seed is used on District lands where groundcover restoration is needed. In return OSBS receives assistance from SJRWMD with burning and specialized equipment projects. 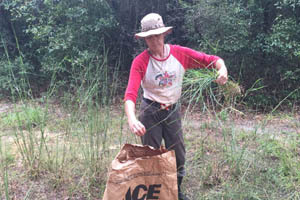 The target species for harvesting are primarily wiregrass and lopsided indiangrass along with other grasses and forbs that respond to growing season fires. Many of these species are seeding in late fall when the harvest is conducted. The techniques used in this effort are a combination of hand and mechanical means. 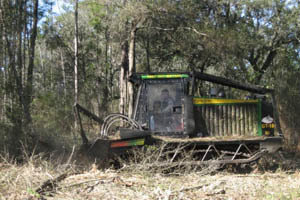 The mechanical effort involves the use of ATV’s equipped with flail-vac harvesters. About half of the seeds are released to the ground with the balance collected for restoration efforts. The goal is to use lite-on-the-land techniques in order to have no noticeable impacts to ground species and soil. Although much of OSBS’s plant communities are in good condition, there are areas that have been impacted by fire suppression and/or drought. When fire is suppressed in sandhill communities, woody species can get established in these areas and begin to shade out important groundcover species. A combination of chemical, mechanical, and fire treatments are applied to restore the important herbaceous groundcover in this community. 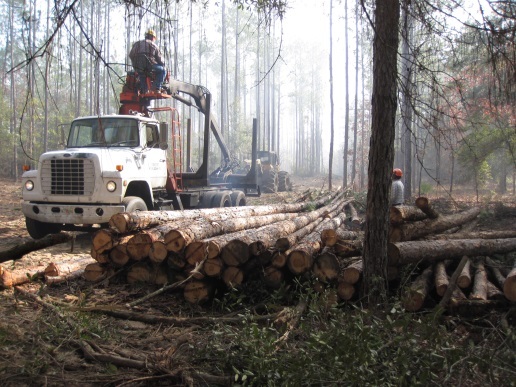 In the case of wetlands, drought or the lack of natural fire allows woody species such as loblolly pines and hardwoods to freely invade these sensitive communities and act as ‘drinking straws’ taking up the available water resources. The reduction or loss of these valuable wetlands causes many wildlife species to lose important habitat for shelter, food, and reproduction. 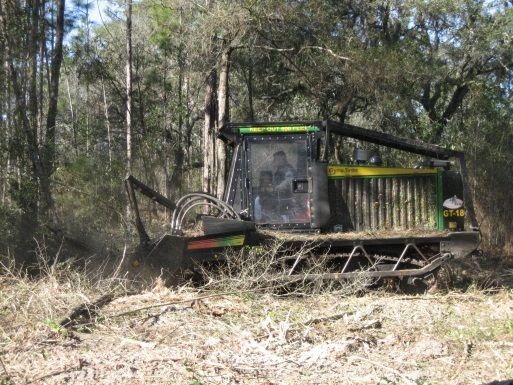 A combination of mechanical removal and reintroduction of fire when moisture conditions are ideal, serve as the primary techniques used in restoration in these situations.